Join the Post Falls Lions Club for Mother's Day Breakfast on May 12. Proceeds go to the Anna Schindler Foundation to help childhood cancer patients and their families. 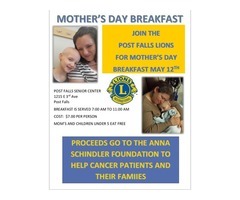 Please join the Post Falls Lions for Mother's Day Breakfast to benefit the Anna Schindler Cancer Foundation.